If you'd like to drive around Europe, you can't bring your own car, and you live outside the European Union, you have two options for obtaining a vehicle: renting or a short-term lease. Renting is just what you'd expect: You pay by the day or week, with or without mileage fees, as you'd do at home. Short-term leasing, also called "buy back" or "purchase-repurchase," may be an even better choice if you need a car for 21 days or longer. 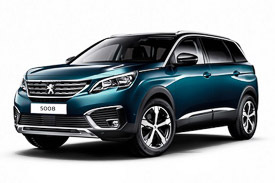 You get a new Peugeot car, van, or SUV and turn it in at the end of your trip. It's a win-win-win situation: You get a bargain rental, the car company can sell the vehicle as a slightly used car, and some lucky European gets an almost-new car while saving on the purchase tax. Your only option for a trip shorter than three weeks. Pick up and drop off nearly anywhere. International one-way rentals may require drop-off fees. Collision damage waiver is extra in most countries, or requires paying a higher inclusive rate. Rate includes VAT of 16-20% or more. Airports and some city locations impose surcharges. Significant savings if you're driving for at least 21 days. Available only to drivers who live outside the EU or have temporary visas. Available to licensed drivers of 18 or older. Pick up and drop off at authorized locations. Locations outside France incur pick-up and/or drop-off fees. Full insurance is included (no deductible). No VAT or airport/city fees.